MBARARA – The Chief Magistrate Court in Mbarara presided over by Samuel Twakire has Monday 25 convicted and sentenced an Army officer Pte. Denis Bataringaya, Don Kizito Baryayesima 44 from Ishongoro in Ibanda, Mbaine Emmanuel 32, a boda-boda cyclist from Nyakayojo division over pouring acid to Amos Katurebe an LCIV councilor representing Nyamityobora ward with an intent to finish off his life and acquitted municipal speaker Bony Tashobya who was found innocent. Court heard that on the night of 8th November 2017, councilor Katurebe while on his way to home on Mile two, Mbarara -Masaka road at around 10 pm was attacked and poured acid on his face before they rushed him to Mayanja Memorial hospital, from where he was rushed to Mengo hospital where he spent almost a year in intensive care unit. Police with other sister security organizations mounted an operation the next morning and arrested the suspects. While reading the judgment, Chief Magistrate Twakire noted with concern that during the submissions of evidence for both prosecution and defense and those of witnesses, that he found evidence of Ssali collaborating with the witnesses presented by the prosecution. However, there was no evidence proving that Tashobya the speaker participated in the committing of the offense. “Court finds that it has been proved beyond reasonable doubt that the accused, Don Kizito, Ssali Geoffrey, Mbaine Emmanuel and Denis Bataringaya participated in committing this case, and accused number one Bonny Tashobya apart from the mentioned political wrangles he had with councilor Katurebe there was no proof pinning him to have participated in the case, so he is found not guilty and therefore Tashobya is acquitted. And others are found guilty and are convicted”. 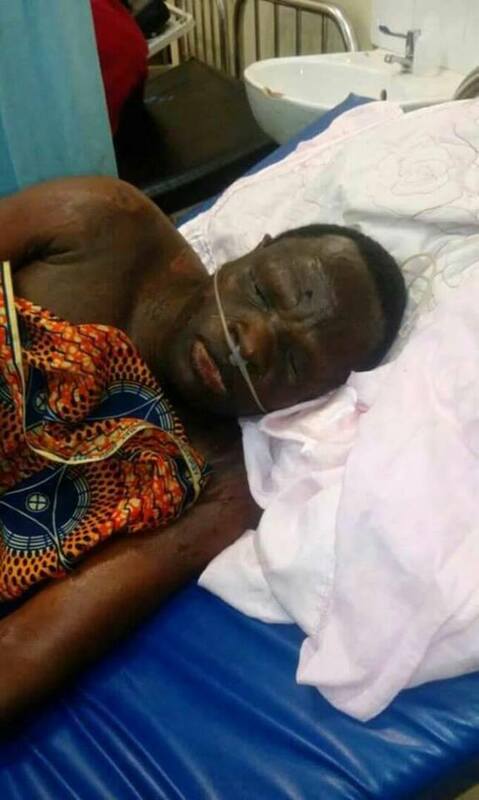 Councilor Amos Katurebe who was attacked and poured with acid in the hospital. Before Twakire read the sentence, Prosecution prayed that the convicts be given a harsh sentence since cases of acid are rampant so as to a send a signal to the public. Lawyers from defense led by Enock Twinamatsiko who represented Kizito and Mbaine prayed that the convicts are first time offenders with no criminal record and that are sole breadwinners in their respective families, he prayed for a lenient sentence. A lawyer representing, Bataringaya prayed, “since Bataringaya is a first time offender and an army officer whose services are still needed in the country, a sole breadwinner in his family and is still in the youthful age, a law-abiding citizen, I pray that he should be granted a lenient sentence since he has been on remand for one year and one month. Chief Magistrate listened to both prayers from prosecution and defense lawyers and ruled that, “section 204 of the penal code Act puts the maximum sentence at life imprisonment and I agree that acid cases are rampant and serious, this should send a strong signal to public, I have considered the period they have spent on remand I, therefore, sentence you to 14 years in prison. He further told the convicts that they have a right to appeal the sentence from the higher court. Poline Kyarikunda the wife to councilor Katurebe expressed her dissatisfaction with the ruling since Tashobya whom they suspected to have planned the whole deal, was acquitted. It should be noted that by the time they poured acid on Katurebe, he was chairing a committee that was soliciting signatures to censor speaker Tashobya accusing him of incompetence, misuse of office and poor administration. In the morning of his, an attack was supposed to testify before the commission of inquiry into land matters led by Justice Catherine Bamugemererire that was at Ntare School over the sale of government land where Tashobya was also accused.